I have been traveling non-stop for the past four weeks and I just flew in from NYC. Boy are my wings tired. 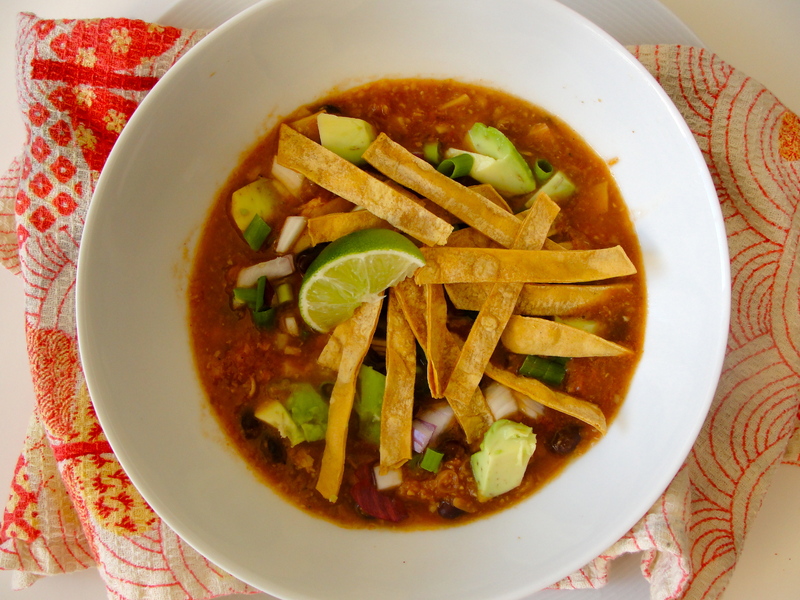 So while I collect my thoughts about the most extraordinary trip (and meals) I just had, let me give you this recipe for a salt-free chicken tortilla soup. Even if it is warming up again in your area of the world, this soup will help kick off the fall soup and stew season. And I hope you find more uses for the salt-free, tomato and corn broth you are about to witness and taste. If you can’t eat tomatoes because they are too high in potassium…use red bell peppers instead and roast them first for an extra flavor boost. If you can’t find no-salt-added tomato paste….go ahead and use pumpkin or sweet potato puree, saving the remainder of the can for a fall dip or ragu sauce. The pumpkin and sweet potato will provide a similar buttery, savory undertone to the broth. And if you can’t eat something else on the ingredient list…then go ahead and post your questions below and I’ll happily come up with the substitutions you need to eat this dish. 1. Preheat oven to 375 dg F.
2. In a medium to large size pot, heat the oil over medium-high heat. Add the chopped garlic and whole coriander seed to the pot and let them sizzle and brown, 5 minutes. Add the corn, stir the pot, and let the ingredients cook another 5 to 8 minutes. 3. Meanwhile, mix the spices in a small bowl and rub half of it on the chicken. Place the spiced chicken in an oven pan and into the oven (when it’s reached temperature), and cook until the inside is white, 20 to 25 minutes. 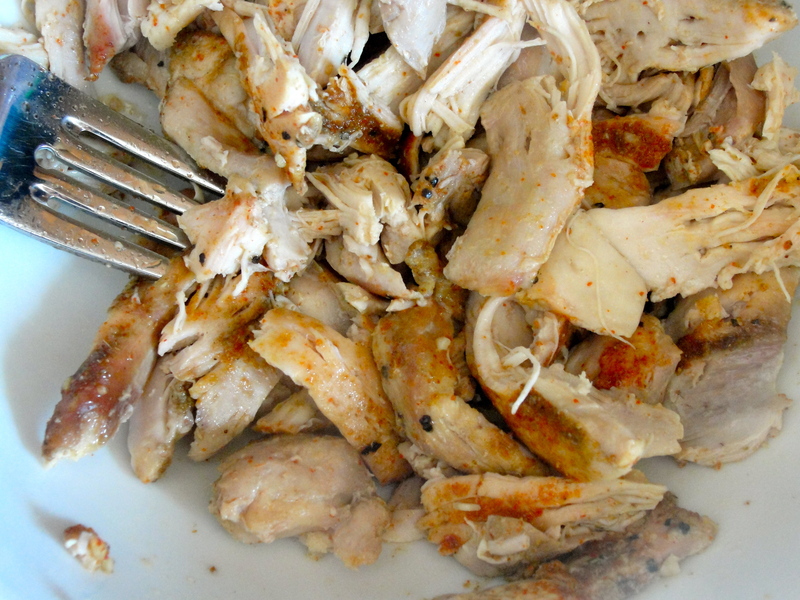 Extra tip: for perfectly easy shredded chicken, you can also boil it in water. 4. Add the tomatoes, no-salt-added tomato paste, and remainder of the spice mix to the pot as well as 3 cups of water and bring to a boil. Then cover with a lid, lower heat, and let it simmer while the chicken cooks. 5. This is a great time to prep your onions, avocado, limes, red cabbage, spicy peppers, and the tortilla strips you’ll use as garnish. Extra tip: throw a few of the tortilla strips in the oven (on a separate pan) to crisp them up as a topping. 6. When the chicken is ready, removed it from the oven and with two forks, pull the meat apart. 7. 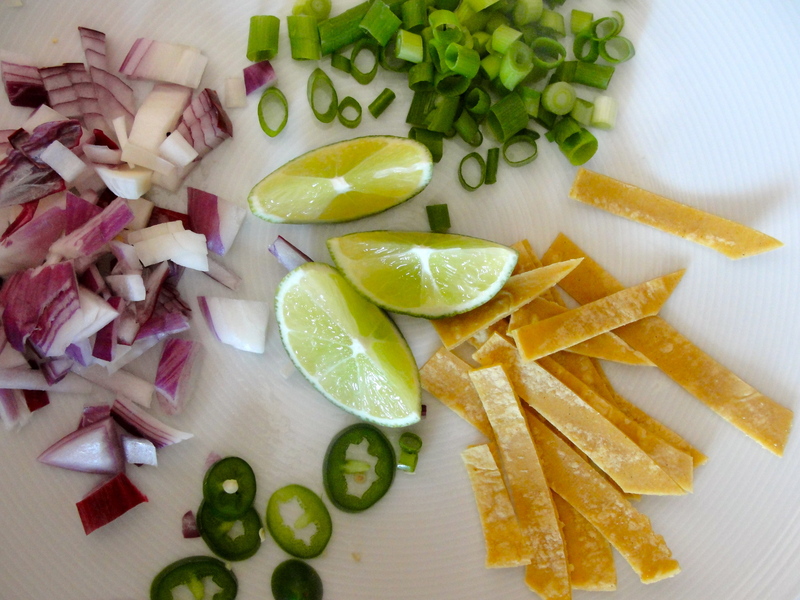 Then, at this point in our tortilla story, you have two choices. 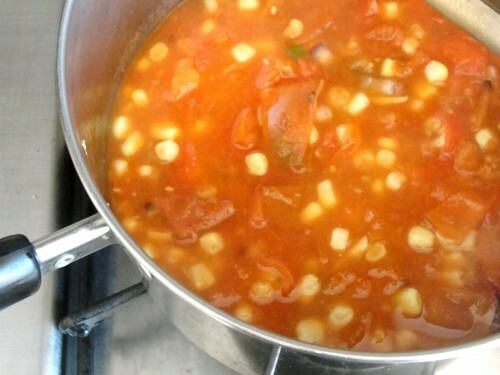 Leave the soup as is–the cooked tomatoes and corn slowly leeching out their own juices to make a perfectly sweet, savory broth. 8. 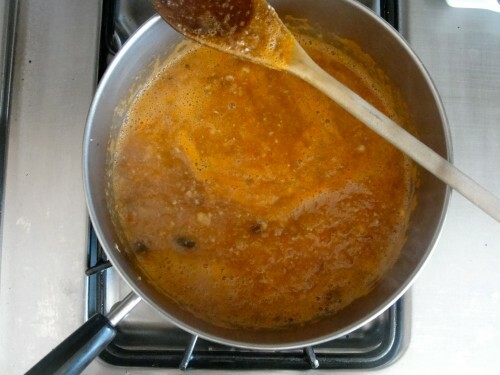 OR you can put half the soup in a blender (or use an immersion blender) and puree, leaving the other 50% a bit chunkier. It all depends on what kind of consistency you are craving. 9. Either way, add the cooked chicken and the no-salt added beans to the pot and bring the entire thing to a thunderous boil. Then lower heat a bit until it is just bubbling and continue to reduce (no lid!) for 15 to 20 minutes. 10. 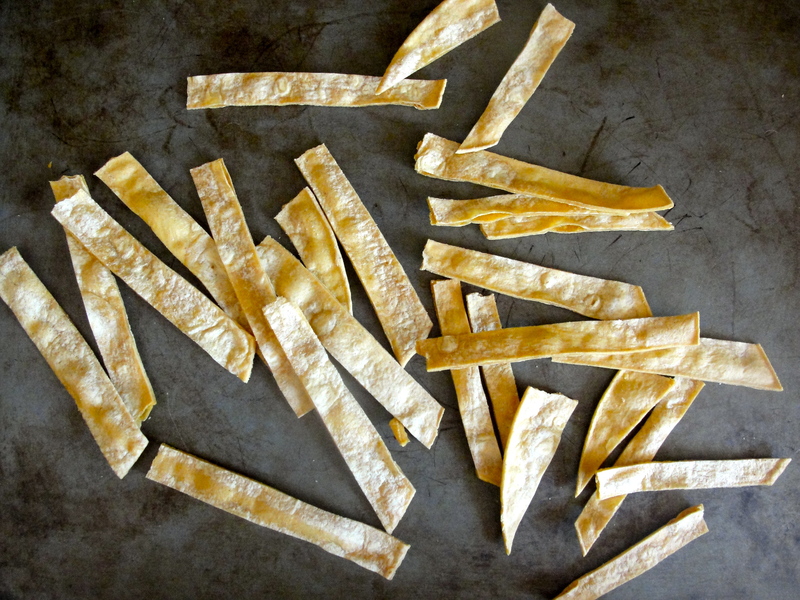 Right before serving, add the soft tortilla strips and cook for 5 minutes. 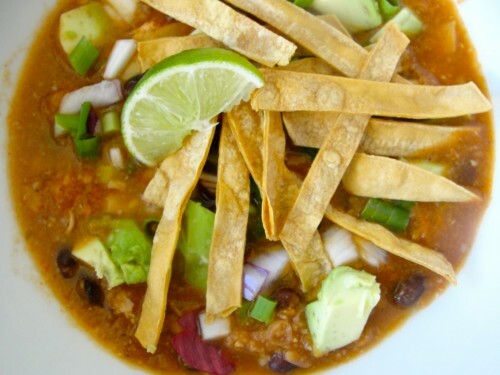 Then ladle the soup into bowls and top with the onions, avocado, chili peppers, crispy tortilla strips, red cabbage, squeeze of lime, and a dollop of creme fraiche or even a little bit of sour cream. Dig in. Made it, loved it! Will definetly make again and share! Can regular cabbage be substituted for the purple cabbage, or will that compromise the flavor? I think you can use any kind of cabbage you like. I personally LOVE the taste and texture of napa cabbage. The purple is just great for its crisp bite and bright color! Thanks for the awesome recipe! It was the perfect dish for a lazy, chilly Sunday evening. One question – I tried cooking the garlic and coriander alone for five minutes as you suggested but ended up burning the garlic. Any idea why that might have happened? I was using ground coriander instead of whole coriander seeds. On the second try, I put the garlic and corn in together and cooked for only five minutes, then added the coriander with the other spices in step 4, which seemed to work well. Also, I substituted Fage Greek yogurt for the creme fraiche/sour cream to save a few calories. Just wanted to pass that tip along for you and your readers! Thank you again! And I know other brands exist. 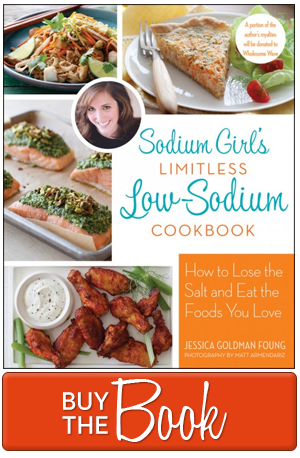 WHen you’re at the market, always give thme a quick look to see if they are salt-free, low-sodium. You’ll be surprised what you find! 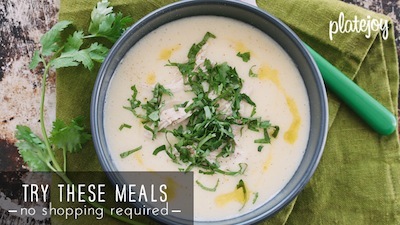 Really looking forward to making this…Looks delicious! I just made this for my family, it was a hit! Thanks for the awesome recipe! if you use chili powder it has a content of 180 mg of sodium per tablespoon..that is really high and not good for us that can use very little salt. also the tortillas are high in sodium content.i am restricted to 1200 mg a day..
You are completely correct. Chili powder and flour tortillas tend to be high in sodium. But you CAN find no-salt-added, 0mg sodium chili powder (at places like Penzey’s) and use corn tortillas (typically around 0 to 15mg sodium) for a low-so swap. What is the sodium content per serving and what constitutes a serving for this recipe?